What a change in the temperature here - certainly a bit of a nip in the air and surely more people have to be thinking about Christmas by now? It's a bit hard to avoid really, given the TV adverts and supermarkets displays. Len was in a local supermarket the other morning and they were playing Christmas carols already - wonder what the staff will feel in six weeks time?!! So, here's the thing. 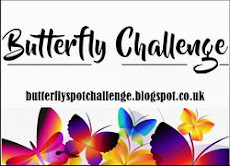 As the snippets challenge is only fortnightly nowadays it's made life a lot easier and this year I won't be doing the 'extra snippets card and prize per day' that I've run a few times over the festive season. I might pop something extra in but haven't decided as yet. 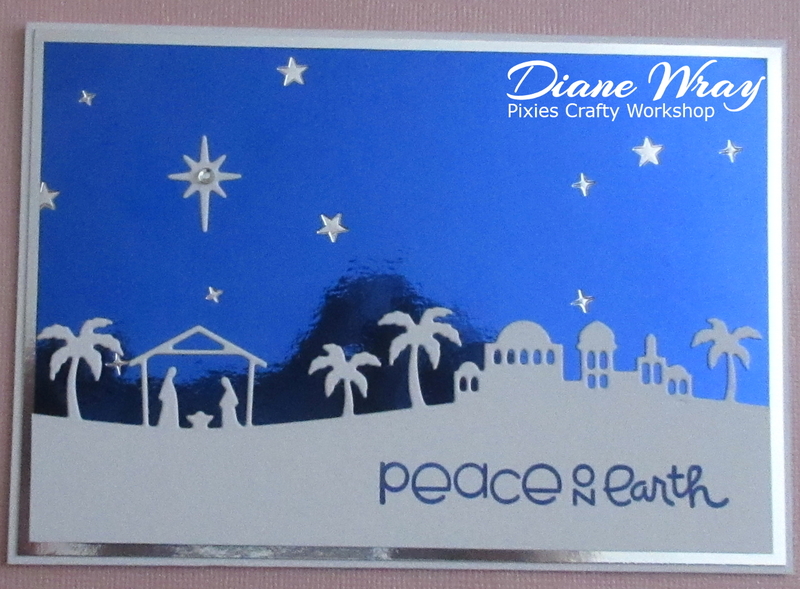 - added the Star of Bethlehem and then popped one small, clear crystal, sparkly gem in the centre - finished! And, it still goes as normal letter rate too. I really enjoyed making this card but the secret is to plan each step ahead a bit like an engineering project. Also measure very carefully to get the right balance between the sentiment, the scene and the sky before you begin to even think about die cutting the Nativity-Scape itself. 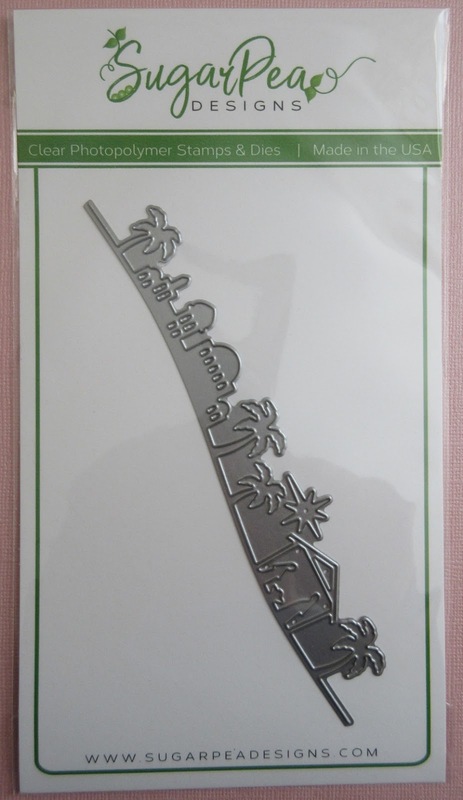 One tip is to be prepared to use tweezers to remove any little scraps of backing paper if you do decide to use Stick-It self adhesive sheet - those little palm trees have the narrowest trunk and in every case the backing paper tore at that point. But gosh, what a stunning die! Also, although I went for a night sky, I've seen some fabulous makes on line where the backing was coloured with Distress inks like a vivid evening sky and the die was then cut from black card. Lots of potential and genuinely one of the most beautiful Nativity scenes I've ever come across. Yup, it's a Sugar Peas 'Nativity-Scape' die and (once again, even though we've had this as a prize previously, 'cos it's such a lovely set) the Paper Smooches 'Christmas Sampler' set of sentiment stamps. 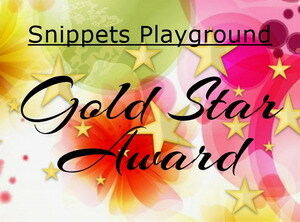 As always, the Snippets Challenge will run for two weeks and the Playground gates will close at 11am UK time on Saturday 25th November. The gates will open again at midnight UK time on the same day. It's a maximum of ONE entry and please say in a comment if you wish to play and be a possible winner of the prize. As I already said, the prize is as above and I will happily split the die and the stamps set, in which case I'd do further draws for the other item. Please also link back to the Playground in your blog post to be eligible for the draw. Speaking of Mr Linky, he seems to have slammed the Playground gates at 10am rather than 11am yesterday - I think it's to do with the clocks changing after I'd set the link widget up. Sorry if you got caught out. Be sure to call back next week to see the winner of last fortnight's prize which is two 6" x 6" Studio Calico 'Snippets' paper pads along with two Woodware 'Numbers' stamp sets, another lovely Guest Designer and my picks from the past two weeks. I wish to play in this challenge. In a side note, as a former preschool teacher we used start singing our performance Christmas songs at least 10 weeks out, so that the kids who only came once a week had enough practices. just been sat here in front of laptop waiting for the internet to come back up so I can leave a comment. I had the same thing with Mr Linky closing an hr earlier with the butterflies too. I do like this little scene you have created and rather like the blue shading that the photo is showing. Will try and enter with the internet and elf production permitting. Darn me if I didn't go to press the send button and I went orange again so have had to reput this in. Hugs Mrs A. If it goes ornage again I'm going to bed!! What a fabulous card, Di. I know what you mean about the mirri card, stunnning IRL, but a b****r to photograph! It really is a gorgeous shade of blue though and I love the contrast with the white. So glad things are easier for you with fortnightly challenges and only one entry per person. I think we were all holding our breath, hoping that you weren't going to close the Playground gates for good! A super cute card with detailing! So festive and cheerful! 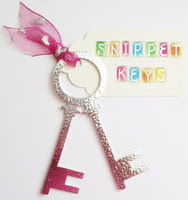 I totally love this gorgeous die with super cute sentiments, Yes for the prize! Wonderful card and you are right about photographing mirri card - virtually impossible so you did well. 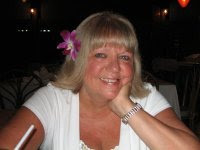 I love the way you describe how you achieve results pointing out any pitfalls along the way - so helpful always. Back later with my offering. That really is a totally delightful Christmas creation Di and a lovely die which you have used to perfection. Making a mental note that it's time to join in again (post it note I mean, my whole computer screen wears a yellow halo of them). A fabulous card Di and I love the die you've used. I always struggle with photographing mirri too as I seem to get my own reflection in it! I'll be in the playground soon and would love a chance to win this week's fab prize - thank you. Beautiful Christmas card Di, I love the buildings set against the night sky. I too find mirri card a pain to photograph, I don’t know anyone who doesn’t! I will be joining the playground soon and would love to be entered into the draw please. Morning Di - I can feel your pain over photographing the Mirri for your beautiful card. I'm amazed to be first into the playground this week! And I'm just playing for fun today as I already have some very similar things. Oh what a fabulous nativity scene Di. LOVE how you created this card (I though the shadow was a mountain range until I read further!). Card is gorgeous. I thought that the shadow behind the houses was made intentionally. It seemed great to me. Photographing mirri card is always really difficult! Your card is delightful, love the blue tones with white and the amazing diecut silhouette with the Nativity scene!! That is a gorgeous card Di, the background looks gorgeous and a wonderful design. Your card is gorgeous Di. Love the background and the die you have used. What a beautiful die and card! The shiny mirror card makes for a dramatic card design and I laughed at your trials and tribulation in trying to get a good photo without all the reflections in it. I guess there are drawbacks to everything, right?! Glad that your slower paced challenge calendar isn't running you as ragged because it's no fun for us if it's a chore for you. Yes please to the gorgeous prize pack! This is a stunning card. Love that mirri card with the stars! Perfect for midnite sky. The die is fabulous and I would love to be considered for the draw! I am sure you are busy with Xmas cards now as the deadline only gives us another three weeks or so. My craft room is a sea of Xmas papers! Gorgeous Christmas card, Di. I'm likely the last to start mine, because I still haven't! Eeek! Oh my! Your mirror card is gorgeous! I can just image how beautiful it is in person. I plan to play because I love both the die and the stamp set. Would love to play with both! STUNNING card, Di. Love the die, you're brilliant design showcases oh so well!!! Yup putting both hands etc up for prize please!!!!!! Adore nativity dies haven't seen this one before. Absolutely gorgeous card, Di! My inner crow loves anything shiny or sparkly. Yes, please, to the very lovely die and stamp set. I do not have a Nativity die and I agree that this is one of the most beautiful ones I have seen. Just gorgeous!! Thank you for another fun day in the Playground!!! Your card is exceptionally beautiful with that gorgeous color and a beautiful scene! I'm playing just for fun this week, but thanks for another snippet playground challenge! Made it and yes please stick me in the pot this time round. Hugs Me. What a beautiful card! That die is so elegant and adorable! And your shiny night sky must look fabulous in real life, but I'm sure it was a bear to photograph! I would love to play for the die this week, but will share the stamp set with someone else. Thanks! Beautiful Christmas Scene :) would love to play for the gorgeous prize, thanks! I love that beautiful rich blue background on your card - gorgeous! Oh! This card is wonderful! And that die! Wow! Yes, please, I would like to take place in the draw. Beautiful nativity card, Di. I love that dark blue mirror paper. I’m sure all that shine is just stunning IRL. Since I have no nativity anything, a nativity die would be a lovely addition to my stash and I always love Paper Smooches sentiment stamps... so yes, please add me to the prize draw. Beautiful Christmas card. Yes please for the prize draw. Love the nativity card Di. Haven't been around for a while hope all is well with you and Parsnip. Just playing for fun. Sorry for not having time to play more often .. .. but at least I have made it today! Loving your card. Very beautiful. Just playing for fun Di, but what a wonderful prize.